In the early 1980's, when I had been belly dancing less than a year, I was invited to perform at a feast organized by the local chapter of Society of Creative Anachronism (SCA), a group that re-enacts the Medieval era of history. The person who invited me to do the performance knew that I was a beginner, but thought it would be fun to have me dance anyway, so I agreed to it. For my show, I did what I had been taught in my classes how to do: I showed up wearing an emerald green bra/belt set with green chiffon skirts and veils. The audience was very warm and responsive, and generally seemed to enjoy the show. Afterward, as I was changing my clothes in the bathroom, one of the women from the audience came in to use the facilities. When she saw me, she asked why I had chosen the nightclub look instead of an ethnic look. I knew there was no point in lying about it, so I came out and said it was because I was a beginner and this was all I knew. That answer seemed to soften what had started as a hostile attitude. Looking back, I know that my costuming was very inappropriate to that setting, but I did the best I could with the knowledge I had at the time. Now, 30 years later, I would like to think I'm a little older and wiser. 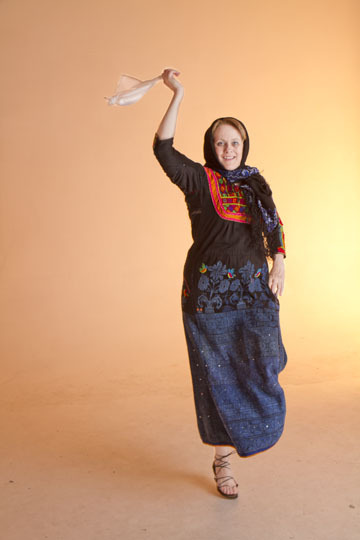 Over the past two decades, I've learned much about the historical and ethnic traditions of Middle Eastern dance, and the dance community's overall knowledge and sophistication has grown. In this article, I'd like to share with you what I wish I had known back then about performing for historical re-enactment events! Chainmail Bikini. The look popularized by Red Sonja in the 1980's might set young men's blood racing, but it's not a valid re-enactment of what Middle Eastern women once wore! There's a reason why they call the genre "fantasy". Save it for the science fiction conventions! Fur Bikini. I'm sure the men would like to touch your furry places, but it's all wrong for historical depiction! This is another choice better suited for science fiction conventions. Xena, Warrior Princess Costume. As a novelty costume for a comedy act at a belly dancing festival or hafla, it might be fun. It would be a big hit at a science fiction or comic book convention. But the Xena look just doesn't match the historical garb of real women from the Middle East and therefore is not the right choice for historical re-enactment. Princess Leia Costume. No doubt about it, Princess Leia looked fabulous in that scene from Return of the Jedi where she was in her slave costume at the feet of Jabba the Hutt. This is yet another choice that would be great for science fiction conventions, but inappropriate for SCA or Renaissance Faire. Anything With Glass Beads and Sequins. Women in historical times who had a passion for shiny things decorated their clothing with shisha mirrors (India), mozunas (Morocco), or coins. Sequins and beaded glass fringe didn't exist yet. Harem Fantasy Looks. Historical re-enactment events aren't the right environment for looks inspired by Disney's Aladdin movie, the 1960's television show I Dream of Jeannie, or the many harem scenes from U.S. movies of the 1940's and 1950's. Leave at home the teeny halter top, the chiffon, and the navel jewel. Harem pants of appropriate fabric would be acceptable, but only as underwear. Fake Generic "Gypsy". I am bewildered by the huge numbers of belly dancers who believe that belly dancing originated in India and was brought to the Middle East by the migrations of the Rom and Sinti. Anybody who has ever learned even a tiny amount about the folk dances of Romania, Bulgaria, Hungary, Macedonia, and other countries where the Rom lived in large numbers will see that the dances of these countries don't even remotely resemble belly dance. Generally speaking, belly dance has no link at all to the Gypsies. Admittedly, there are some Rom and Sinti who perform belly dance, but they do so in countries such as Turkey, Lebanon, and Egypt where belly dancing already existed as the indigenous dance, and they embraced an opportunity to make a living by working as performers of that pre-existing local music and dance. The first step to choosing a costume for a historical re-enactment event is to invent the character. Renaissance Faires and Society for Creative Anachronism events are usually centered around Medieval or Renaissance Europe. Belly dancing, on the other hand, comes from Turkey, the Eastern Mediterranean, and Egypt. So to create a belly dancing character, a helpful starting point is to define which region that character comes from and why that person had a reason to be in Europe. Some dancers describe themselves as being part of a merchant family that brings goods from the East to sell in Europe, or perhaps a traveling band of entertainers. Others spin a tale of being war brides, brought home from the Crusades. The first thing to remember about dance costuming for historical depictions is that Oriental dance originated as a social dance. People did it in the normal clothes they might wear to visit their neighbors or attend wedding festivities, and they still do today. Before the arrival of the European colonial presence, there was no such thing as a separate "dance costume" because Oriental dance had not yet become a "performing art". So when researching historical dance costumes, just research what women actually used to wear for everyday attire and model your costume on that. The Ottoman empire based in Turkey begin in the 15th century, and lasted until after World War I. Over the centuries its influence expanded to cover the entire northern coast of Africa, much of eastern Europe, and most of the Arabic countries. Much trade occurred within the empire, and carried the cultural influence of the Turks across many lands. This style of women's clothing was widely worn throughout the Ottoman empire and eventually inspired the garb of the 18th-century Ghawazee in Egypt. As of the sixteenth century, the Ottoman fashions would have been seen not only in Turkey, but also through the Levant (eastern Mediterranean) and Egypt. The illustration below comes from an Italian book titled Costumi Orientali (Oriental Costume), published in the 17th century. Gömlek. The lightweight white blouse made of gauze-like material, such as that worn by the woman on the right in the drawing above. Shalwar. These are pants, full at the hips and tapered to narrow at the ankle. Entari. This is a fitted long coat, worn over the gömlek. Yelek. This is a fitted outer jacket, cut short at hip length. To make one of these ensembles, see the "Turkish Dancer" pattern by Folkwear Patterns. The headdress is not a turban, because turbans were worn by men. The above drawing shows some fancy adaptations of a pillbox hat. The Levant is the region east of the Mediterranean consisting of Lebanon, Israel, Palestine, Syria, and Jordan. If hot weather is expected at the event, a traditional thobe (dress) from the eastern Mediterranean region offers a comfortable option. The long sleeves provide protection from sunburn. Made of light-weight cotton broadcloth, it would be cool even in hot weather. If wearing it in cool weather, warm undergarments such as long underwear could be used. 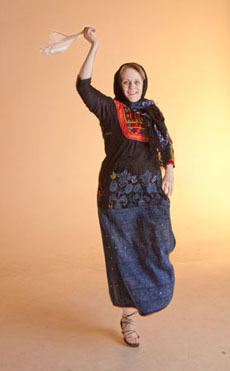 Although belly dancing would be appropriate when wearing this style of dress, another dance style that would go with the look would be the line dance known as debke. The one with red embroidery in the photo to the left was made in Syria and hand-embroidered. The dress would need an appropriate head scarf to complete the ensemble. Click on the photo to see the dress in more detail. The one with amber embroidery in the photo to the right is Palestinian, also hand-embroidered. PHOTO CREDITS: The photo of the Syrian dress on the left is by William M. Smith, Iowa City, Iowa. The photo of the Palestinian dress on the right is by Pixie Vision Productions, Glendale, California. Folkwear Patterns offers three different patterns to make dresses of this type. The dress I'm wearing in the above left photo is the same style as Folkwear's Syrian Dress pattern. The Palestinian dress I'm wearing in the above right photo is the same style as Folkwear's Gaza Dress pattern. Another suitable pattern from Folkwear for dresses representing the Levant would be the Bethany Dress. Outdoor events put significant wear and tear on clothing. For that reason, I would recommend decorating with a durable method that isn't very time-consuming to do such as machine embroidery or fabric painting. See The Folkwear Book of Ethnic Clothing by Mary S. Parker for ideas on how to use machine embroidery to create a Syrian style of dress. Another decorating option might be simple fabric painting with acrylic paint - for example, on the Syrian dress the yoke could be made of red fabric, and the black diamonds painted in, then some red paint used along the sides and sleeves. Egyptians understand about the need to dress comfortably in hot weather. It is common for temperatures in Luxor and Aswan to exceed 110 degrees Fahrenheit (43 degrees Celsius) in the summer! Egypt has multiple ethnic groups within its borders, and each one's traditional clothing has some distinctive elements. One option for Egypt could be a Bedouin thobe similar to the Levant thobes discussed above. The embroidery designs used by the Bedouins in Egypt are somewhat different from the ones of the Levant, but the cut of the Palestinian dress and that of the Egyptian Bedouin dress are very similar, so the Gaza Dress pattern from Folkwear mentioned above could be used to make garb for a Sinai Bedouin character. As with the Levant, the Egyptian Bedouin aesthetic could include dancing either debke or Oriental dance. In the photo to the right, I am wearing a Bedouin thobe from the Sinai region of Egypt. Another option, for a Nile Valley aesthetic, is the Egyptian gallabiya. This can be made of a light-weight fabric such as cotton broadcloth which remains cool in hot weather and washes easily. The Cairo flavor of the women's gallabiya would often be decorated using a form of embroidery around the front placket area that consists of appliqueing ribbon to the garment to form designs. Soutache braid is frequently used for this purpose, as well as wider ribbons. Couching is also often incorporated. A Saidi style of gallabiya could be made of fabric with vertical stripes and a cane dance could be done with Saidi music. The photo to the right illustrates typical decoration in the soutache embroidery style. The garment in this photo is an abaya, a coat intended to be worn as an outer garment when going out in public. This abaya was custom-made for me in Egypt, and I use it as a cover-up to keep my costume hidden when I'm not on stage. For purposes of Renaissance Faires and SCA events, a simplified version of an abaya such as this could be worn over the gallabiya as a cover-up when not performing, and it can also help stay warm in cool weather. 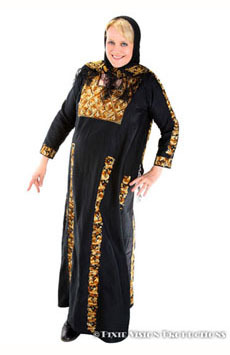 The traditional color for an abaya is black. In both the Levant and Egypt, it is common for people to tie a scarf around their hips when they get up to belly dance even though they wouldn't wear one for more mundane activities. The hip scarf would not be used for debke. The gallabiya could be made using the Egyptian Shirt pattern by Folkwear, and lengthening it to full dress length. For a men's gallabiya, choose white, tan, olive green, or narrow stripes. For a women's gallabiya, any color that you can identify in your research of dyes available in Egypt during the SCA/Renaissance periods should be fine. In Tunisia and Morocco, the traditional garment worn by women evoked memories of the Roman toga. In Tunisia, it was called the malia, and in Morocco the haik. This garment would be very comfortable in hot weather, but you would need to take care to avoid sunburn. Historical re-enactment events often take place outdoors in hot weather and dusty conditions. Consider that when deciding what to wear. Here are some thoughts to keep you comfortable while you look great. Jewelry. Metal jewelry looks wonderful, but could become very hot and even painfully uncomfortable if you're likely to spend a large amount of time in the sun. Keep Cool. Wrap ice in a small towel that has been soaked in cold water and hide it under your headdress for merciful relief from hot conditions. Reflect Heat. Light colors will absorb less heat from the sun than dark colors, and may be more comfortable in hot weather. Natural Fibers. Even if you're not a historical purist when it comes to fabric choices, natural fibers such as cotton, silk, and linen still have several advantages over synthetics. They breathe better, and therefore won't feel as hot. There's also safety to consider. If you're likely to be dancing near a fire, natural fibers are much safer in the event a spark flies in your direction. Polyester and other synthetics can be very dangerous around fire. Washable Fabrics. Historical re-enactment events typically occur outdoors under dusty conditions. Consider fabrics such as cotton that hold up well under washing and beware of fragile decorations that might not survive your laundry equipment. Color. I haven't researched what colors of dyes may have actually existed during the Medieval and Renaissance eras, so I can't advise you on that. But one consideration is to choose colors that will be easy to see in your dance environment. For example, at SCA events, people often enjoy dancing around the campfires at night. Costumes in red, orange, and black would be difficult to see in such lighting, so you might consider colors that would be more visible by firelight. Another consideration is that light colors will show dirt and grass stains more readily than darker colors. Turbans worn by women. In the Middle East, turbans were traditionally a men's garment. Belts of plump yarn tassels. In the Middle East, plump yarn tassels were used to decorate the halters of camels and horses, not human beings. Cholis. These garments come from India, not from the Middle East. Coin bras. The brassiere was invented in the 20th century. Although some say it was invented in 1913, there were earlier similar garments worn by dancers, actresses, and singers portraying the tale of Salomé. For example, Maud Allen's wildly popular Visions of Salomé toured England in 1908. In any event, the brassiere is not something that would have been seen in the Middle East during the time period represented by SCA events and Renaissance Faires. Bare midriff. Middle Eastern women kept their bodies covered. In Islam, a woman is instructed to "cover her beauty". Multi-tiered skirt. These were inspired by flamenco ruffled skirts in Spain, not by anything women traditionally wore in the Middle East. Now, I'm not saying Tribal-style costuming is inherently "bad". I'm just saying it doesn't represent what people actually wore in the Middle East at any point in history, and therefore is not what I would recommend for historical re-enactment. It's fine to wear it for belly dance events, county fairs, alternative music events, city festivals, science fiction conventions, and other places where you're not specifically portraying historical people of the Middle East. Despite what I said above, there are admittedly many belly dance troupes who wear Tribal-style costuming for Society of Creative Anachronism events and Renaissance Faires. There are also people who wear fur bikinis, elf ears, fairy wings, and chainmail bikinis to these events. Not everybody who attends these events places a high priority on cultural and historical accuracy - some place a higher priority on fun, creativity, and expression of personal fantasies. Each person who participates in these events decides for herself how to balance fantasy and practicality with historical accuracy. Just as most people attending these events use modern-day toilets or porta-potties instead of sneaking off into the woods to relieve themselves, and just as most people use sewing machines to create their garments instead of assembling them by hand, so some choose attire that is not historically accurate. Different event organizers require different standards with respect to historical accuracy of costumes, music, and dance style. As a performer at a historical re-enactment event, you have a responsibility to ask the organizer what the policy is for this event. If the organizers respond that they expect historically and culturally accurate presentation, then you have a responsibility to either comply or refer the opportunity to someone else who can. But if the organizer gives permission for fanciful choices, then a Tribal style of costume is probably fine. If you wear Tribal-style garb at historical re-enactment events whose organizers accept fanciful deviations from historical styles, don't worry, I won't send the Ethnic Police to arrest you. All I ask is that you make choices that respect the wishes of the event organizers, and that you provide honest information to audience members and other people who may ask you about your clothing. Just as I told the truth about why I wore what I wore when confronted at that SCA event back in the 1980's, so I would ask you to tell the truth if others ask you about your costume today.